About Us | Denver Garage Doors & Entry Doors | Affordable Door Co.
My name is Peter Mentz, co-owner of Affordable Door Co., Inc. I have over 33 years experience in the garage door industry. In 1995, I founded this company in Denver, Colorado, and within six months was joined by my wife, Mary Anne, who is now a co-owner. We feel very fortunate to be able to work together day after day, building our business and simultaneously strengthening our relationship. Because Mary Anne and I are involved in every garage door estimate, service call and installation, we can truly say that Affordable Door is a family run business. We are both well versed in all aspects of our business. With Mary Anne handling most of the phone calls, she can schedule convenient appointments and estimates that fit with your needs. Our service repair turn–around time generally is within one or two days. 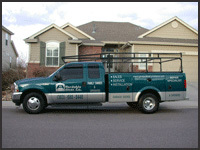 Please don’t hesitate to give us a call, we’ll be happy to meet with you and help with your garage door service needs. Click the town names in blue below for details on our services in the Greater Denver area where you live.